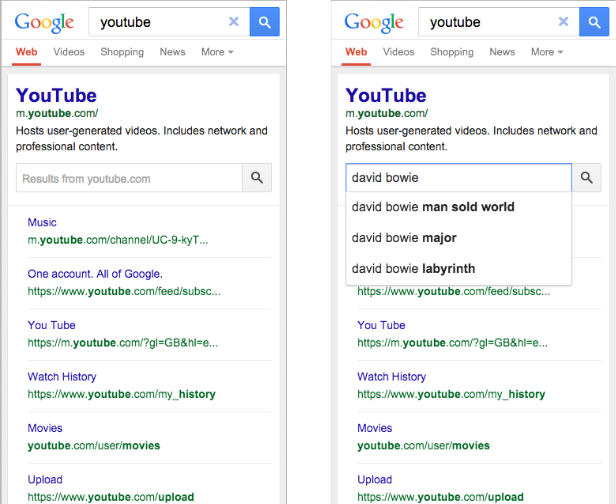 Google today updated its sitelinks search box, used for searching within websites directly from Google’s search results. The company has made the search box more prominent (it is now above the sitelinks section), as well as added support for Autocomplete and the ability to send the user to the website’s own search pages. The last part requires that webmasters have a working site-specific search engine and use correct the markup on their site. To let Google know you want this second search box to appear and send users directly to your site’s search results page, you can mark up your homepage as a schema.org/WebSite entity with the potentialAction property of the schema.org/SearchAction markup. You can use JSON-LD, microdata, or RDFa to do this (details here). If you’ve never seen this search box before, it comes up when users search for a company by name. Google has found that users are often looking for something specific on that website, and it would thus display a larger set of sitelinks and an additional search box below that search result. For the uninitiated, this second search option is the equivalent of using the “site:” command on Google.com, which few users actually use (for example, if you want to find this article, you could type “Google site-specific search site:thenextweb.com” directly). Since the sitelinks search box is becoming more robust, Google is likely hoping that more sites add support for it, giving non-power users a better experience.